Last Wednesday was a once in a lifetime date. 12th December 2012 - 12/12/12. Did you do anything special for this unique date? A bunch of us got together on the 12th to do a 12/12/12 Christmas canvas. Each of us had twelve main elements to place on canvas. There were reindeer, ornaments and trees. I chose tin soldiers for mine. Angela Collingwood also chose soldiers and she backed them with guard houses. I decided to keep it simple and did glittery blue shaped tags on mine. The canvas is very long at 100cm x 20cm. Perfect for that sliver of wall. Some of us did our canvases horizontally, while others did theirs vertically. The canvases were mod-podged with Christmas papers and allowed to dry. After that, layers of acrylic paints in favoured colours. I kept mine pretty light so the bottom paper would still show through. I then added silver acrylic paint around the edges and dabbed on some pearl mica flakes. 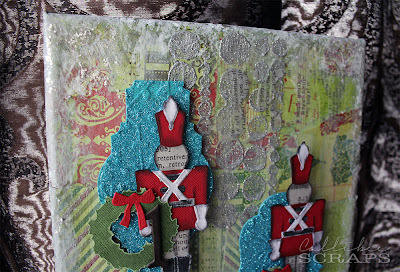 I also stenciled on silver glitter glue through a circle template. The soldiers were die cut and pieced together after distressing with black soot. 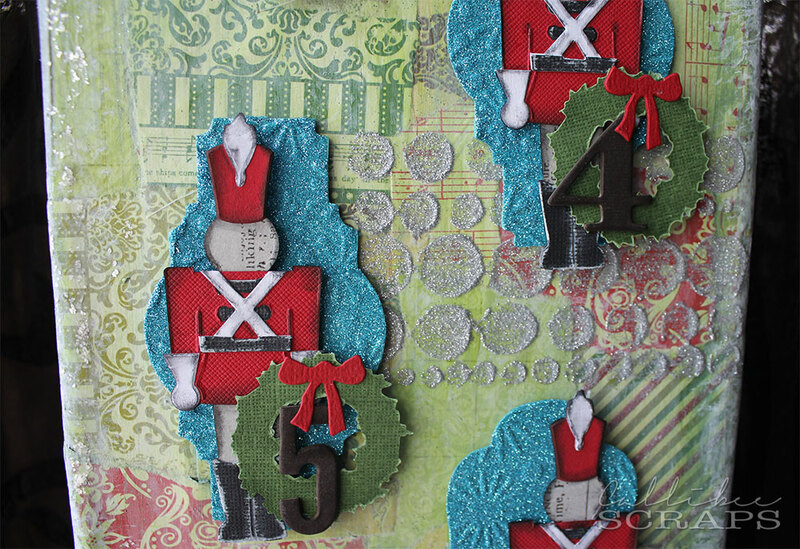 I die cut, embossed and painted the backing before covering them in blue glitter. 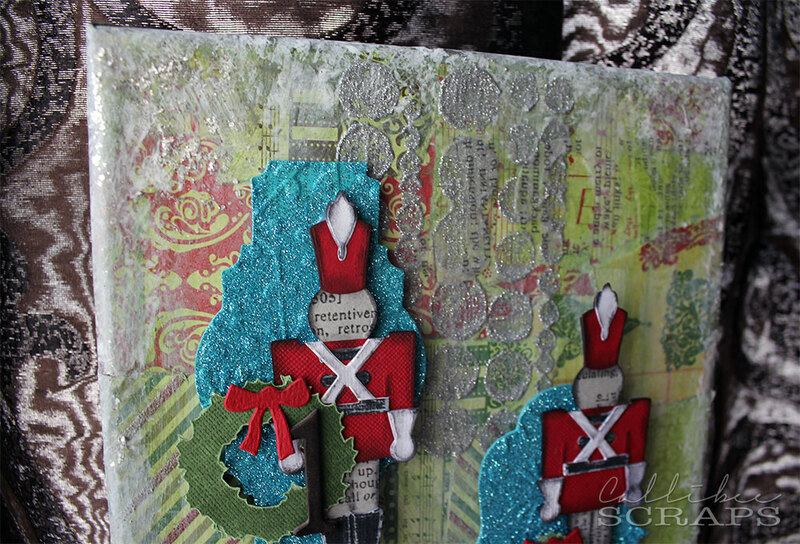 I love how the embossing shows up in certain light under the glitter. The soldiers were then stuck on with hot glue and I added mini wreaths and die cut numbers to finish off. Hope you'll try something similar. It was a lot of fun. This will be used to count down the twelve days of Christmas and can be taken out every year to be used again and again. In fact, why not do one of these for every occasion?